If you are acerbic with someone you are criticizing him in a clever but critical and mean way. When you are astringent towards someone you speak to him or write about her in a critical and hurtful manner. A caustic remark is unkind, critical, cruel, and mocking. If you describe something, especially food and drink, as delectable, you mean that is very pleasant, tasty, or attractive. If you describe something as palatable, such as an idea or suggestion, you mean that people will accept it. Something that is poignant affects you deeply and makes you feel sad or full of pity. Rancor is a feeling of bitter ill will or intense dislike towards another person. Trenchant comments or criticisms are expressed forcefully, directly, and clearly, although they might be hurtful to the receiver. If you describe something as unsavory, you mean that it is unpleasant or morally unacceptable. Wholesome can refer to something that is good for the health of your body, and also for your moral health. Bitter, acrid smoke billowed out of the warehouse as the fire gained strength. The firefighters used their masks to keep the acrid, burning fumes out of their lungs, but breathing was still difficult near the entrance engulfed by black smoke. The few employees still remaining in the building coughed and choked on the biting, acrid smoke as they ran toward the exits. Many of the rescued employees used harsh, bitter, and acrid language to describe their anger at the building’s lack of safety. Quiz: Try again! What is an acrid substance? Something that is poisonous or harmful. One that is bitter and sharp, either in taste or smell. An acrid remark is mean, bitter, and highly critical of someone. Get Rid of It! Ack! These acrid smells are too bitter--get rid of them! Acrid smells or comments are sharp, keen, or fierce to the nose or to the mind. 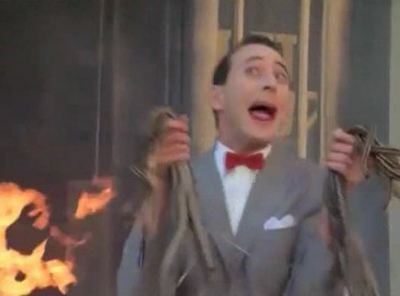 Pee Wee's Big Adventure The acrid smoke of the fire finally does Pee Wee in.